New products driven by research advances are delivering the benefits of enzyme technology to improve the performance of young pigs. 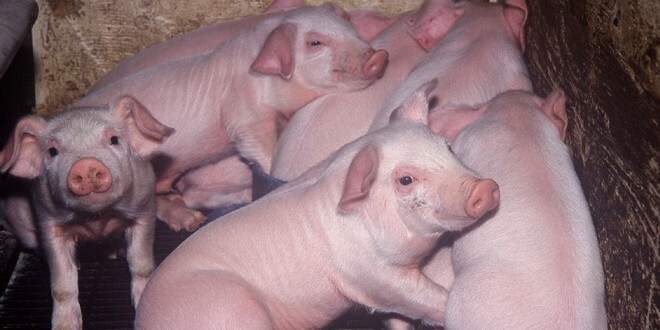 Two leading examples are the products Superzyme-CS and Superzyme-W from Canadian Bio-Systems Inc. (CBS Inc.) The company has been involved in pioneering the science and product development on exogenous enzymes for young pigs, which has delivered breakthrough results in recent years supporting the development of these products and others. Superzyme-CS is an enzyme supplement designed for diets which use proteins such as soybean, canola, peas, and grains such as barley, wheat and corn. Superzyme-W is designed for use in feed where 70 percent or more of the grain is wheat - the product is also effective on other cereal grains and plant protein sources. The approach of the company is based on a strong commitment to research-driven innovation, geared toward making livestock producers and their industries more profitable, says Owen Jones, founder and president of CBS Inc.
"We know this area because we have been in it from day one," says Jones. "We funded and partnered in the leading science, and we have worked closely with producers and the industry to help them implement the best approaches and get the most value. Most important, we are continuing to push the pace of innovation with new science and products that will help pig producers get continually better results." CBS Inc. funded and partnered in pioneering studies on enzyme benefits for young pigs, which were directed by Dr. Bogdan Slominski of the University of Manitoba. These early investigations included breakthrough results showing the pre-biotic effects of enzyme supplementation in nursery pigs. The enzyme formulations used in these studies were supplied by CBS Inc., and were specifically and uniquely blended to produce the benefits shown. These benefits include: Reducing the acute impact of E. coli infection; enhancing nutrient absorption and gut health; improving average daily gain and feed intake; and providing a viable, natural alternative to traditional growth promoting products. Among the key results in these studies, infected pigs had 10 percent reduction in pathogen colonization and 34 percent improvement in daily gain. The specific blends of enzymes used in these studies was critical to the results, says Rob Patterson, technical services manager of CBS Inc. "The use of Canadian Bio-Systems enzyme formulations was consistent not only in the main studies, but also in all preliminary enzyme research leading up to the selection of enzymes for this research." Superzyme-CS and Superzyme-W are just two examples of CBS products that are based on these studies. Started in 1984, Canadian Bio-Systems is a world-wide pioneer in developing innovative products for livestock feed and other uses, backed by strong research and technical support. More information on the company and its products is available at www.canadianbio.com.